Geology Sreamside in area of morainic Drift. Record Name Aysgarth pasture. Two burnt mounds just 1km east of Castle Dikes Henge. Record Description 2 Sites. One large and turf covered on the northern bank of a small canalised stream in pasture 1km to the east of Castle Dikes Henge. The other burnt mound is of medium dimensions,and revealed by the presence of burnt stone in the bank of the same canalised stream. * Indicative dimensions: Size: Small <6m, Medium 6m-9m, Large 10m-15m, Extra large >15m. Height: Low <0.5m, Average 0.5-1.0m, High >1.0m. Additional Notes These two burnt mounds, together with the two further burnt mounds recorded (SWAAG63) at Flout Moor Springs 800m to the west of Castle Dikes, should be seen as indicating transient/transhumant settlement activity contemporary with the henge. Image 1 Description Aysgarth CP. 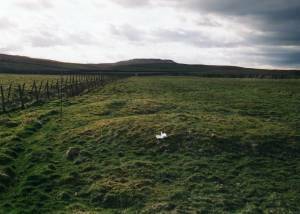 The larger of two burnt mounds in pasture south of Flout Moor Lane.